Welcome to the Toot-Toot drivers garage from VTech! This interactive garage includes a cute tow-truck vehicle that you can zoom around, drive up and down in the lift, spin on the turn-table or whiz down the winding ramp! Drive the truck through the car wash, fill up at the petrol station and be rewarded with lots of fun sound effects and phrases. Helps the child improve their motor skills, social and emotional development, physical development, hand to eye co-ordination, visual development, sound awareness and creativity. Also includes exit gate featuring a magic sensor that magically recognises the vehicle. Introduces numbers and music. Garage recognises all Toot-Toot Drivers vehicle range (sold separately.). General information: Size H17.8, W50.8, D40.6cm; Batteries required: 3 x AA (included); For ages 12 months and over; EAN: 3417761249031. Welcome to the Toot-Toot Drivers Garage! 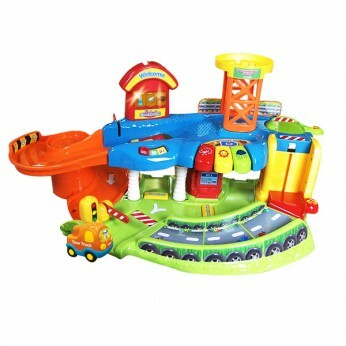 This interactive garage includes a cute tow-truck vehicle that you can zoom around, drive up and down in the lift, spin on the turntable or whiz down the winding ramp! Drive the truck through the car wash, fill-up at the petrol station and be rewarded with lots of fun sound effects and phrases. Also includes exit gate featuring a magic sensor that recognises the vehicle. Introduces numbers and music. Garage recognises all Toot-Toot Drivers vehicle range (sold separately). Requires 3 x AA batteries (included). This toy costs approximately £29.99 (for the latest and best prices make sure you check our retailer list for the VTech Toot-Toot Drivers Garage above). In our review of VTech Toot-Toot Drivers Garage we classed it as being suitable for ages 1 to 3 years but recommend you check the manufacturer specific advice before purchasing. A fun range of toys, my son wasn’t really interested until around 18m and we now have the whole range!